Not a whole lot of progress made stitching wise today. I did some work on my Shaker Sewing Box which I will try to post a shot of tomorrow. It was an incredibly long day that left me feeling drained so I had planned to just relax in the evening after everything was done but my itchy stitching fingers got the better of me. I started digging around more for the strawberry charm that I knew I had, and along the way I found this long lost scissor fob that goes with my Hillside Samplings Sewing basket. 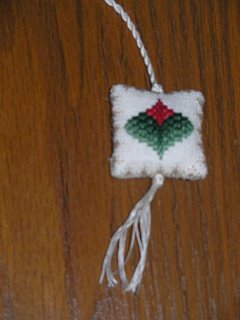 A little more digging for my invisible thread as I have no idea what color pearl cotton this is anymore and tada, a new scissor fob is done :) I also did finally find one of the strawberries I was thinking of for my name tag. Its a mill hill treasure that is a simple red strawberry. I have it sitting on the tag right now deciding if I'm going to attach it while I fret over the assembly of the whole thing. I have it laced to the plastic canvas as you see in the post below and now I have to attach ultra suede to line it and then whip stitch it together through the backstitch border. It just seems this thing is going to be incredibly thick and bulky! If I remember right the assembly was adapted from an Ellen Chester design that one of the ladies in the guild did so I may pull that out tonite and see how she has you finish and see if those directions are any more clear. Love that piece alot! New blog design looks great! Really nice!